Deep within the darkness of your past, a new terror is taking shape. Written and directed by Jason Christ. Produced by Jason Christ, David Propst, and Eric Stanze. Starring Emily Haack, Benjamin Gaa, Eric Stanze, David Propst, Ceily Davis, Jonathan Baker, Julie Farrar, Anna Knobeloch, Eric Spudic, and Lisa Morrison. Commentary track by director Jason Christ. 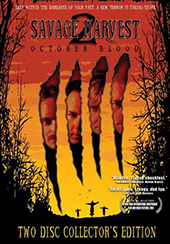 Commentary track by FX Artist Patrick Voss, Executive Producer Eric Stanze, and Director Jason Christ. Commentary track by actors Emily Haack, Benjamin Gaa, Eric Stanze, and David Propst. Deleted scenes with optional commentary by director Jason Christ. Three short films by Jason Christ. Tyge Murdock, a successful director of low-budget horror films, has been chasing monsters his whole life. When an actor is accidentally killed on the set of his latest production, Tyge returns to his hometown to reassess his life. But all new nightmares await him there… His path soon crosses that of Ashley Lomack, his high school sweetheart who vanished from his life after a gruesome mass murder ten years earlier. The sole survivor of this massacre was Ashley’s older sister Mikki. Consumed by the rumors of demonic possession surrounding the murders, Tyge soon finds himself trapped in a deadly chain of events. The demonic forces erupt once more for another night of terror and carnage. Tyge, Ashley and their friends must now unravel a bizarre mystery as the night of gore-splattered violence engulfs them!